A person always need to have an entry and exit plan in hand before undertaking any entry in the stock as one need to have a solid reason to enter the stock and equally a perfect reason to exit the stock. 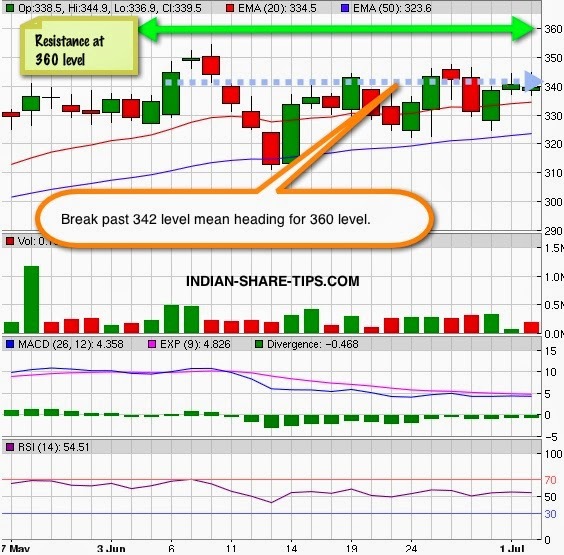 We suggest a buy in CESC above 342 level for target 360 level in short term and once it breaks past 360 level than it can touch 367-374 and higher levels. Our clients are long in the stock and we recommend you to check our delivery tips to make money like professionals by holding for small period like 5-8 days and if you want to go for intraday than remember to check out the sure stock of the day as money lies in trading less but trading accurately.